Pancakes…my total and utter weakness. I usually keep things simple with plain buttermilk pancakes drizzled with maple syrup. But I decided to have a little fun with some leftover pineapple and a can of coconut milk in my pantry, and made these amazing Piña Colada Pancakes. 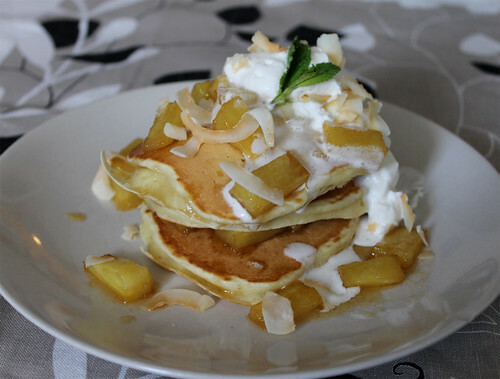 Rather than using all buttermilk in the recipe, some coconut milk was used in the batter instead to enrich the pancakes with some coconut flavour. The addition of the shredded coconut added a wonderful textural quality to the fluffy pancakes. And instead of maple syrup, a very tropical and delicious pineapple-rum sauce was served with the pancakes, topped with some whipped cream flavoured with—you guessed it—more rum. This is a decadent brunch entrée for sure, but I promise you, these will make any weekend morning that much more special (and worth getting out of bed for)! Sift together the flour, sugar, baking powder, baking soda, salt, and shredded coconut. In a separate bowl, whisk together the wet ingredients. Slowly add the wet ingredients into the dry ingredients and stir until just incorporated. Do not overmix; your batter should still be a little lumpy. Set aside the batter to rest for 10 minutes. 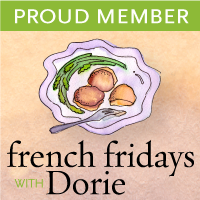 Heat some oil or butter in a cast-iron pan or heavy skillet over medium heat. Drop a small ladleful of batter into the centre of the pan and let cook until bubbles begin to pop in the centre, about 2 minutes. Flip pancake and cook for an additional minute or two, until golden brown. Keep the pancakes warm in a very low-temperature oven while you finish cooking the pineapples. Pile a couple of pancakes onto a plate, and serve with pineapple=rum sauce and rum cream. To make the the pineapple-sauce: Heat 3 tablespoons sugar and a tablespoon water in a small, heavy skillet over medium heat, stirring occasionally until the sugar has melted. Allow the sugar to simmer for about 2 to 3 minutes, when it just starts to brown. Add the pineapples and toss to coat, and allow to cook for about 2 minutes, to allow the pineapple to soften a bit and release some of its juices. Sprinkle in some salt and cinnamon and stir. Remove the pan from the heat and add the rum. Carefully hold a lighter close to the pan until it catches, return the pan over the heat, and allow the fire to burn off the alcohol. 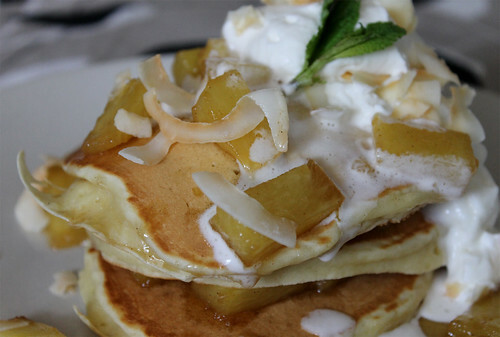 Cook for another 30 seconds, and serve with the coconut pancakes immediately, and some rum whipped cream. To make the rum cream: Put all the ingredients into a bowl and whisk until stiff peaks form (or use an electric mixer). Keep in the refrigerator until ready to use.